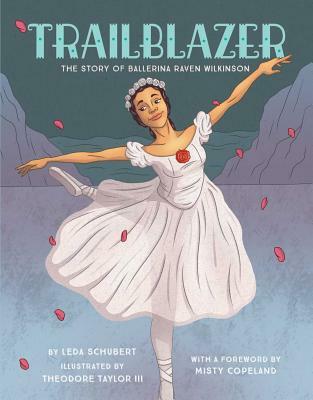 Trailblazer: The Story of Ballerina Raven Wilkinson (Hardcover) | novel. This beautiful picture book tells the little-known story of Raven Wilkinson, the first African American woman to dance for a major classical ballet company and an inspiration to Misty Copeland. When she was only five years old, her parents took her to see the Ballet Russe de Monte Carlo. Raven perched on her crushed velvet seat, heard the tympani, and cried with delight even before the curtain lifted. From that moment on, her passion for dance only grew stronger. No black ballerina had ever danced with a major touring troupe before. Raven would be the first. Raven Wilkinson was born on February 2, 1935, in New York City. From the time she was a little girl, all she wanted to do was dance. On Raven's ninth birthday, her uncle gifted her with ballet lessons, and she completely fell in love with dance. While she was a student at Columbia University, Raven auditioned for the Ballet Russe de Monte Carlo and was finally accepted on her third try, even after being told she couldn't dance with them because of her skin color. When she started touring with her troupe in the United States in 1955, Raven encountered much racism in the South, but the applause, alongside the opportunity to dance, made all the hardship worth it. Several years later she would dance for royalty with the Dutch National Ballet and regularly performed with the New York City Opera until she was fifty. This beautiful picture book tells the uplifting story of the first African American woman to dance for a major classical ballet company and how she became a huge inspiration for Misty Copeland. Theodore Taylor III's unique, heavy line style of illustration brings a deeper level of fluidity and life to the work, and Misty Copeland's beautifully written foreword will delight ballet and dance fans of all ages. Leda Schubert has taught at Vermont College of Fine Arts. She is the author of many books for children, including The Princess of Borscht, Ballet of the Elephants, Monsieur Marceau, and Listen: How Pete Seeger Got America Singing. She lives in Plainfield, Vermont, with her husband and two large dogs: Pogo (a very good boy) and Pippa (slightly insane). Find out more about Leda at ledaschubert.com. Theodore Taylor III is an illustrator living in Richmond, Virginia, with his wife Sarah and son Theo. He works as a front-end web developer by day and illustrates children's books by night. He received the Texas Bluebonnet Award and the Coretta Scott King-John Steptoe New Talent Award for his work in When the Beat Was Born: DJ Kool Herc and the Creation of Hip Hop. He also recently illustrated three books for Shaquille O'Neal. His work is inspired by his love for music, comics, animation, video games, street art, and more. He is also a self-proclaimed pizza connoisseur. Find out more about Theodore at theodore3.com. Dreamers Believe Anything Is Possible. A true Trailblazer (Little Bee, Jan. 2018; Gr 2-5), Raven Wilkinson (b. 1935) was the first African American ballerina to dance with a major American touring troupe. The book opens with a five-year-old Wilkinson breathlessly waiting for a performance by the Ballet Russe de Monte Carlo. After beginning ballet classes at age nine, she worked hard at her craft, and, while a student at Columbia University, auditioned for the Ballet Russe. Though told they would never accept her because of her race, she persevered, and was offered a spot after her third attempt. While touring the U.S. with the company, she encountered instances of racism, segregation, and true danger. Though she danced solo roles, filling the stage with joy and grace, a ballet mistress informed her that a black dancer would never be given the lead of Swan Lake, and she left the company in 1962. She later danced in Holland (where, as she stated, "people were far more interested in who I was, rather than what I was") and eventually returned to perform with the New York City Opera and take on acting roles. Misty Copeland, who became the first African American principal dancer with the American Ballet Theater in 2015, credits Wilkinson as an inspiration and mentor, and the book ends with the two meeting after Copeland performed the lead in Swan Lake. Throughout, Leda Schubert's flowing text and Theodore Taylor's appealing animation-style artwork emphasize Wilkinson's hard work, talent, quiet dignity, and perseverance, and reveal the importance of remaining true to one's dreams. Schubert presents a moving profile of Raven Wilkinson, the first African-American woman to dance with a major American touring ballet company. After years of studying ballet, Wilkinson was accepted into the Ballet Russe de Monte Carlo in 1955. Schubert describes Wilkinson's thrill in performing around the United States, even as racist attitudes limited her opportunities and posed real threats to her safety; in one scene, four of Wilkinson's fellow dancers stand protectively around her after men rush the stage at an Alabama performance, angry about the "nigra" in the dance company. Taylor illustrates in a style evocative of midcentury comics, juxtaposing graceful dance scenes against a backdrop of racial turmoil. This admiring portrait is bookended by a foreword from dancer Misty Copeland and a grateful closing note from Wilkinson. African American Raven Wilkinson broke the color barrier for touring American classical dance companies by joining the Ballet Russe de Monte Carlo in 1955, and she traveled the U.S. dancing beautiful ballet while confronting ugly bigotry. Raven's love for and commitment to her art saw her through such difficult times as when her troupe's stage was rushed by men spewing epithets. Schubert's succinct text places Raven's life in the context of &lt;i&gt;Brown v. Board of Education&lt;/i&gt; and the KKK. Many of Raven's own words and descriptions are used, such as her recounting how she sometimes lightened her skin while refusing to "deny my very being and who I was." These are accompanied by Taylor's clean, large-scale pictures. Back matter includes a personal note from Raven, a glossary of ballet terms, and a bibliography, and her important story and inspiring impact is brought forward with a connection to, and personal testimonial from, the contemporary dancer Misty Copeland, whom Raven inspired-just as she will inspire readers.